It's isolating to feel dark when everyone (and everything) seems so bright. The weather is warm, the sun is shining, and barbecue and cottage invites abound, but that doesn't mean summer can't bring you down. Caring for your mental health in the warmer months can bring a host of unexpected challenges. Some people experience Seasonal Affective Disorder (SAD) during the summer instead of the winter. Other people deal with depression, or other mental health struggles, year round — and it can be hard to feel badly when everyone around you seems to be having a great time. If you struggle with addictions, the party-heavy focus of the warmer months can bring challenges, and if the weather is uncomfortable, it's hard to keep that from affecting your mood. Read on to learn more about how to care for your mental health in the summer months, what the most common issues are, and how you can improve your health and feel better. There's growing awareness of the mental health struggles some people experience during the winter months. But some people do experience SAD in the summer months, as well. Some of the symptoms of summertime depression are the same as SAD in the winter months, including depressed mood, hopelessness, and feelings of worthlessness. But SAD in summer months can also be associated with insomnia, appetite loss, weight loss, and anxious or agitated feelings, according to the Mayo Clinic. If you have bipolar disorder, the warmer months of the year can be a time when your symptoms change. Research has found some connections between bipolar disorder and SAD, and some people report that their symptoms change seasonally. The Mayo Clinic reports that some people with bipolar disorder are more likely to experience manic symptoms during the summer months. For some people, substance use is an issue, whether you are sober, working towards being sober, or otherwise working on your relationship with alcohol or other substances. And many summer activities — barbecues, time spent on patios, etc. — revolve around alcohol use. Simply speaking up can help head off some problems. "Most people are aware that I am sober," Trevor Scott, communications director for CAST Centres, which offer mental health and substance abuse treatment, told HuffPost Canada. "However, when I was newly sober, I made people aware that I wasn't drinking." Talking to your friends and family can open up support networks you didn't know you had. There is evidence that exercise can help with mental health, but more broadly, it can be hard to focus on your physical health when your mental health is a struggle. If that sounds daunting, start small. "At times, it feels like a really heavy weight to do physical activity in the summer," Scott said. "But if I set small physical goals, and follow through, the physical health has always helped with my mental health." If your preferred form of exercise is an outdoor activity, like running, Dr. Dawn Jonas, a naturopathic doctor at the Southwest College of Naturopathic Medicine, suggests taking advantage of the longer daylight hours and exercising in the evening when temperatures are cooler. 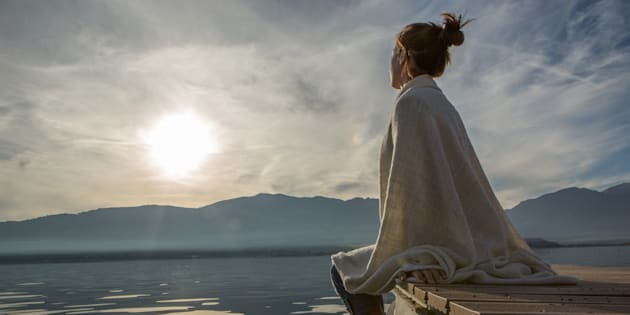 When the sun is up for longer it can be tempting to stay up to enjoy it, but maintaining your existing routines is one way to keep your mental health in check. "One of the best ways to protect our mental health in the summer is set a consistent bedtime that is early enough to wake refreshed with the sun and get outside," Jonas told HuffPost Canada. This will help protect your circadian rhythms, she added. It's easier to stay inside if you aren't feeling your best during the winter months — people are more likely to bunker down when the weather is cold and stormy. But in the summer, many people like to spend time outside, have parties, and otherwise socialize. If you aren't feeling up to that, it can be easy to start feeling isolated. Joining a fun social, summer-specific group can create an easy way to get out and spend time with people — for example, look for a recreational league for a sport you enjoy. Aim for a balance between avoiding isolation and giving yourself some time alone to recharge. "For myself, socializing is positive for my mental health. At the same time, I make sure to book one day a week with no commitments for myself, creating alone time," Scott said. "Because if I don't have my alone time, and don't have the ability to recharge, I am not good to socialize with anyone." Scott recommends finding a way to stay busy as a means to cope in social situations where you are focusing on being sober, but it's a strategy that can help in other times, too. "One of the best ways that helped me if I ever felt squirrelly was to get busy and be helpful," he said. "I would help out at the BBQ, setting up the table, cleaning up, anything I could do to keep myself occupied and feel a part of." For example, consider setting up a housekeeping routine — it gives you something to do if you feel antsy or anxious, and keeping your surroundings organized can have positive mental and emotional benefits. Or take up a hobby that requires activity and focus, such as needlepoint or doing puzzles. Keep yourself well hydrated during the hot months of the year in order to keep your energy levels up, Jonas said. And eat as well as you're able — enjoy the great produce available at this time of year, and go for foods that are simple to prepare and perhaps can be enjoyed socially or outside. Make your meals a pleasure, something about your day you look forward to. Mental illnesses can be treated, and there are a variety of options that you can look into including therapy and medication. Depending on your situation, your doctor may prescribe medication, suggest therapy, or suggest you get more physical activity. Some people also find mental health benefits from meditation and other mindfulness practices. Talk to a doctor or mental health professional about your symptoms to learn more about what may work best for you.